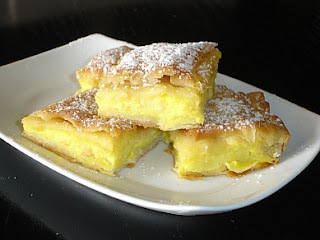 This is a recipe for Bougatsa (pronounced with a soft g) which is yet another delicious sweet. People often buy these from small shops on the street and eat them as they are walking. The quality in these shops varies, as you can imagine, but the recipe below will produce a tasty pastry and delicious filling. After the 1 hour, take one of the balls of dough and on a floured surface roll it out into a circle approx. 40cm diameter. Put the milk and the 100g butter in a pan and stir until the butter has melted. Before the milk boils, Put the corn flour, semolina, sugar, eggs and vanillas in a bowl and mix well. When the milk comes to the boil, add the mixture from the bowl and stir very well until it thickens. Remove from the heat and pour into the oven dish on top of the pastry. Fold the edge of the pastry inwards on top of the edge of the filling. Melt the 30g butter and brush over the top. Place in a preheated oven at 180 degrees Celsius for 40 minutes or until it has gone golden brown. OmG, nothing better than warm bougatsa. It looks really yummy, why don't you offer Pakistani recipes in Urdu? they are really tasty. I also like Biscuit trifle it is one of the sweet dishes.